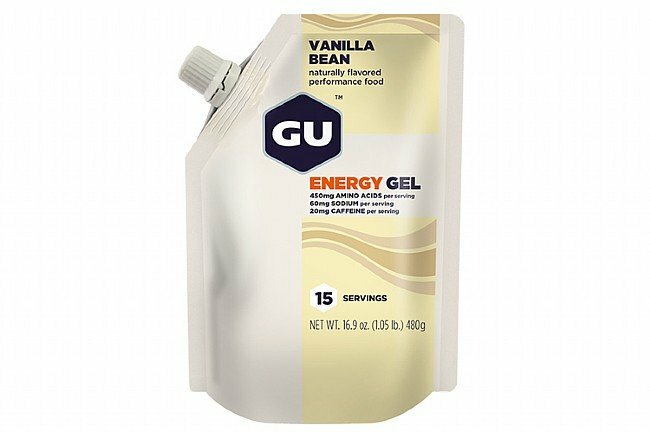 GU Gel's finely-tuned carbohydrate formula provides the energy to keep you going strong with muscle-building amino acids and recovery-aiding antioxidants. This 15-serving pouch works with reusable flasks for added convenience and reduced waste. 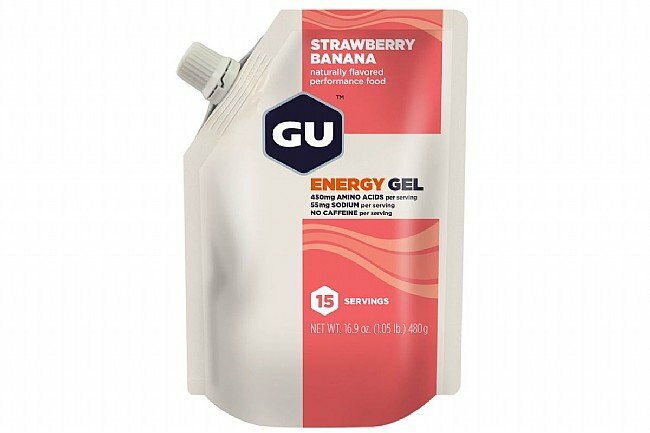 Combining complex and simple carbohydrates in the form of maltodextrin and fructose, GU Gel is able to provide a quick-acting long-lasting energy supply to keep you fueled throughout your ride. Sodium and potassium electrolytes help maintain proper hydration, and the addition of amino acids helps prevent mental and physical fatigue while also promoting muscle recovery. 100 calories per serving. 15-serving pouch. Note: Salted Caramel flavor contains 20 mg caffeine per serving. The concept is great. The application vessels are NOT, including the Hydroflask...which really isn't good unless you emptyclean it weekly. Love the taste and very easy on my stomach. I have seen numerous comments about the flask and related on-bike storage but do not see 6 individual packets that each leak and make a royal mess after opening as being a better system. I do not want 6 opened, sticky packets in my jersey pockets. The problem is that gel is inherently messy and incredibly sticky - you cannot 100% empty it from any container. Personally, I would rather have a single large flask than repeatedly tear off the little opening tabs at risk of squeezing while doing that and covering myself with gel. And it is just not that hard to put a flask in a pot of hot water to clean it. I'm a fan of GU for providing me everything I need from 2 hour rides to 8 hours. I get these bulk packs and squeeze 4 oz in to a Hammer 6 oz flask, add 2 oz of water, and shake. This gives me a much easier, less messy way to consume on the go. Best value, particularly when these are on sale. Great taste with a little kick! Love the salted caramel flavor. Has a small amount of caffeine in it, it gives you a pickup without the jitters, so it can be used multiple times for long rides. At the sale price it was less than $1 per serving. Tastes good, easy to access on bike, prevents a bonk. Like the taste, used this on a Gran Fondo and it worked. While I used the refuel stops to fill water bottles I didn't need to get food. Spent less time at the restrefuel stops more time on bike, finished faster. Triathlon training, particularly running, just finished a marathon holding the flask filled with salted caramel. Goes down easy and keeps me from being hungry. The flavors I have tried all taste good and I still enjoy them at the end of a ride not just at the beginning. Easy to fill the pouch and easy to eat on the go. At $1serving (the regular price), I don't find particular value in buying bulk. A GU competitor sells their bulk bottles at $0.77serving. The premium GU Roctane is $1.66serving. That MSRP is too steep for me.